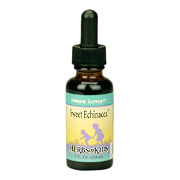 Echinaceas incredible popularity is due to its well documented safe and effective immune stimulating properties. It has both antiviral and antibacterial capabilities. Many people use Sweet Echinacea at the first sights of cold or flu. Research suggests that Echinacea be taken when needed. If you are looking for a long term immune building tonic see the Astragalus Extract information. For deficient conditions that require immune building see the Echinacea/Astragalus information. Take directly or mix drops in small amounts of pure water or juice and drink. Formulated for children over one years of age. 1-2 years (up to 24 pounds) 15-20 drops (.7ml - 1ml) as needed up to 3 times a day. 3-6 years (24-48 pounds) 20-40 drops (1ml - 2ml)as needed up to 3 times a day. 7-11 years (49-95 pounds) 40 drops (2ml) as needed up to 3 times a day. 12 years to adult (over 95 pounds) 60 drops (3ml) as needed up to three times a day. A proprietary blend of an extract of Echinacea purpurea root. Sweet Echinacea Alcohol Free is shipped in a discrete, unmarked package. Orders are processed immediately and usually take about 3 to 5 working days to be received. We do ask that you try it for 2 to 3 weeks to feel the full effects. Any information received is used only for order processing and shipping purposes. Your information, such as e-mail address, will never be disclosed to a third party.